In human history, the Sun is a dreaded and holy object. They are not exactly wrong. What our ancestors knew was that the Sun provided a very important element for most of life on Earth. Without solar energy, vegetation can not grow, and without plants, animals have no food source. However, what we know today is that our ancestors simply did not know what the true sun was. Our scientific knowledge has increased, so has our understanding that the Earth is only a fraction of the larger structure we know as the solar system. What we have discovered is that although other planets in the Solar System may not have life, the Sun also affects the planet. 1. The sun covers 99.86% of the mass of the solar system. It has a mass of about 330,000 times that of Earth. This mass comes from three quarters of hydrogen and most of the rest is helium. 2. One million Earths can fit inside the Sun. If the sun is hollow, about 960,000 globes of the earth will fit in it. However, the earth is compacted in the cavity, then it can contain 1,300,000 Earths. The surface area of the Sun is 11,990 times Earth. 3. One day the Sun will devour the Earth. The sun will continue to shine for about 130 million years until one day all hydrogen runs out. As long as the size of the Sun is getting bigger so it will swallow Mercury, Venus, and Earth. Upon reaching this point the Sun will become a red giant star. 4. 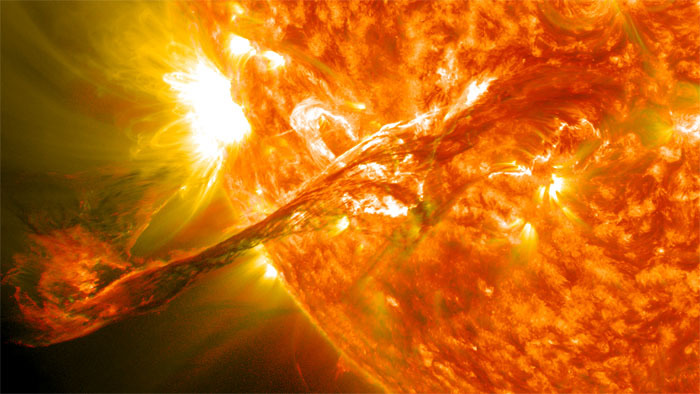 The energy created by the solar core is nuclear fusion. Most of this energy is generated when four hydrogen nuclei converge into one helium nucleus. 5. The sun moves at a speed of 220 km per second. The Sun's distance of about 24,000-26,000 light years from the center of the galaxy and the Sun takes about 225-25 million years to complete one orbit from the center of the Milky Way. 6. The sun will end up being Earth-sized. After the Sun has completed the red giant phase (Red Giant) the Sun will collapse. At that time the mass of the Sun will not change, but has the same volume as the Earth. When that happens, it will be called the white dwarf. 7. It takes eight light-minutes from the Sun to reach Earth. The average distance from the Sun to Earth is about 150 million km. Light drove 300,000 km per second Jia speed and distance is divided then menghasilan 500 seconds (eight minutes and twenty seconds). This energy can reach Earth in minutes, but it takes millions of years for light from the core to reach the surface of the Sun. 8. The sun has lived half in its life. At 4.5 billion years old, the Sun has burned about half of the total hydrogen and still has enough left to continue burning hydrogen for another 5 billion years. Today the Sun is called a yellow dwarf star (Yellow Dwarf). 9. The distance between Earth and the Sun changes. This is because the Earth travels on an elliptical orbit path around the Sun Distance span between 147-152 million km. This distance becomes one of the Astronomical Units (AU). 10. The sun rotates in the opposite direction of the Earth. The sun revolves from west to east instead of east to west like the Earth. 11. The sun spins faster at the equator than near the poles. This is known as differential rotation. 12. The sun has a strong magnetic field. When magnetic energy is released by the sun during a magnetic storm, solar flares seen from Earth are shaped by sunspots. Sunspots are dark areas on the surface of the Sun caused by magnetic variations. The cause of the area looks dark is because the temperature in the area is much lower than the surrounding area. 13. The temperature inside the Sun can reach 15 million degrees Celsius. This energy is generated by nuclear fusion at the core of the Sun when hydrogen is converted into helium and as the object will generally expand, the Sun will explode like a gruel bomb if there is no tremendous gravitational pull that holds it all. 14. The sun produces the solar wind. This is due to the release of plasma (highly charged hot particles) coming from the Sun layer known as corona and this wind can travel through the solar system at a rate of 450 km per second. 15. The sun is made up of three layers: the photosphere, the chromosphere, and the corona. 16. The sun is classified as a yellow dwarf star (Yellow Dwarf). This is the main sequence star with a surface temperature between 5,000 and 5,700 degrees celsius (9000 and 10,300 degrees fahrenheit). 17. Aurora Borealis and Aurora Australis are caused by the interaction of the solar wind with the earth's atmosphere. The interaction of the solar wind with the earth's atmosphere causes a beautiful colorful light pillar at the poles. But if the magnetic field is very strong will disrupt the radio communication system. 18. Proton Arch is another type of aurora borealis. Based on study, this caused of earth atmosphere that scatter proton more than electron. Then it will produce bright white and long curve in the sky. 19. The sun can be black hole. When their mass collapsed into one infinitely small dot. The gravitational will crazy pull all thing into the hole. 20. We are made from star dust. Our Sun begin to develop, Sun spread dust around. And they become a planet, moon and asteroid then orbiting Sun. And of course our all living thing matter is same as star ingridient.